‘Move Live on Tour’: Grand Forks, ND (07/13/2014) – Miscellaneous Photos, Fan Tweets, Photos, and Videos! ‘MOVE Live on Tour’ played the Alerus Center in Grand Forks, North Dakota, on July 13! This was their 3rd concert in a row, but cast & crew were still rocking it 110%…. but sadly, Derek tweeted that he sustained a minor injury at the end of the show and apologized to the fans waiting outside to meet him. What a sweetheart! Hope your injury heals fast Derek! 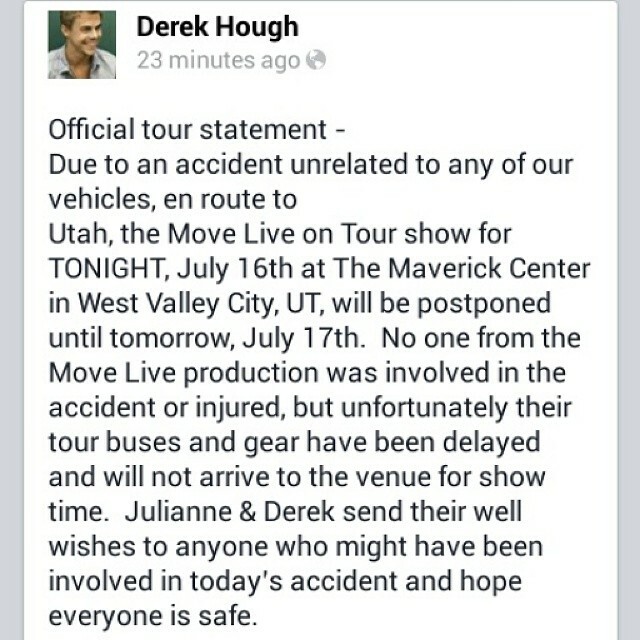 Good thing they have today (July 14) off before their concert in Denver, CO, tomorrow. Nina Dobrev was also there, tweeting out some fun photos from rehearsal and before the show. This was her 3rd concert in a row… Lucky girl! Derek and Julianne also brought a lovely young lady named Brooke Van Reede up on stage. Check out all the great tweets, photos and videos below. Oh yeah, there was something new last night… a CONGA LINE!! This will NEVER get old!!!!!!! Review & photos from last night’s show from WDAY Channel 6 news! 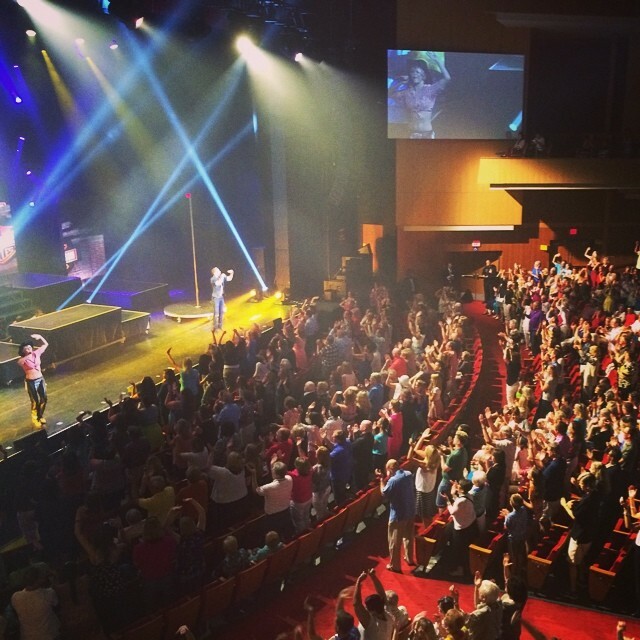 ‘Move Live on Tour’: Sioux City, IA (07/12/2014) – Miscellaneous Photos, Fan Tweets, Photos, and Videos! 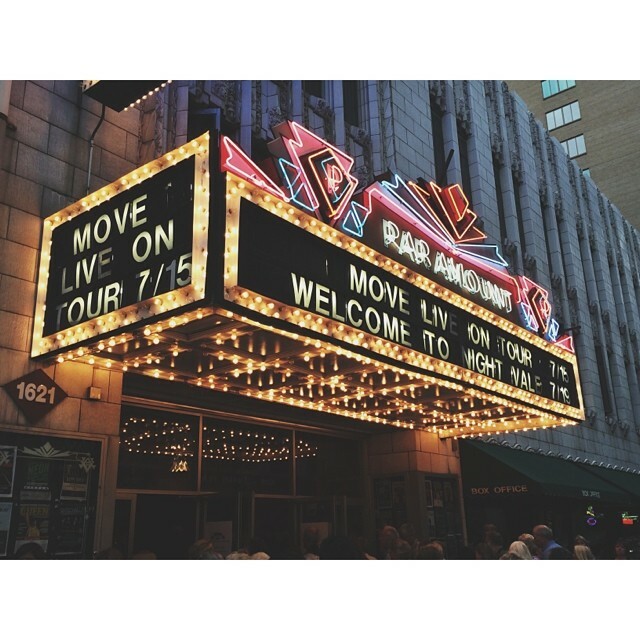 ‘Move Live on Tour’ played the Orpheum Theater in Sioux City, Iowa, on July 12! Once again the fans raved about the show… no surprise! Generous fans shared some wonderful video and photos which you can see below. Nina Dobrev (Julianne’s bff & actress from Vampire Diaries) was also there for her second show in a row… Check out the video Derek shared on his instagram of Nina dancing with the MOVE dancers on the bus after the show! It looks like the dance party doesn’t stop after the show. I love everyone’s energy! When the bus is rockin, keep on a knockin’! Check out this awesome review by Joanne Fox for the Sioux City Journal, who sounded like she absolutely loved the show! “Sioux City, you guys are awesome!” Julianne shouted at the end of the song. The presentation showcased the legendary footwork of Derek, 29, and Julianne, who will turn 26 on July 20, which resulted in seven mirror ball trophies for the pair. Ballroom purists may have been hoping for some “slow, slow, quick, quick” foxtrot steps or “cotton eye Joe” country moves. But the incorporation of a variety of dance styles, special effects, fabulous video projections and spectacular lighting was outstanding on a simple set that had a nine-step staircase and several large black cubes for different levels of dancing. Derek was particularly strong in a shirtless number as were his backup male dancers with their own six-pack abs. Their moves were so precise and provocative, it was hard to decide whether to hold up a paddle (like the DWTS judges) or go out and have a cigarette. Not to be outdone, Julianne – in a breath-taking, red sequined dress – performed a Latin dance with her support dancers. Then, Derek joined her, still shirtless, as a toreador, and they flawlessly danced a paso doble, with Derek doing some fancy twirling of Julianne’s skirt, as if he were preparing for a bullfight. 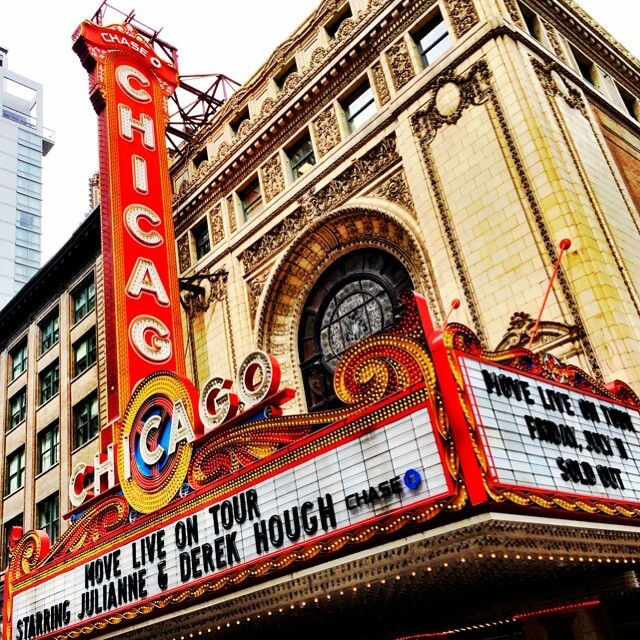 ‘Move Live on Tour’: Chicago, IL (07/11/2014) – Miscellaneous Photos, Fan Tweets, Photos, and Videos! ‘Move Live on Tour’ landed in Chicago, Illinois, on July 9 and performed what sounds like an absolutely AMAZING show! Many of our MOVE dancers commented on Instagram and twitter about the incredible audience. It really does make a different to them the amount of energy the audience gives…. the more you give them, the more they give back to us!! But first, the cast & crew enjoyed a day off in Chicago and many went sightseeing based on their Instagram photos. One of Julianne’s best friends and Derek’s ex-gf, Nina Dobrev (The Vampire Diaries), surprised Julianne and Derek by attending their Chicago show, as well. Check out all the fun photos below!! HQ Photos from Minneapolis, MN, concert at Northrup Auditorium!! Check out this interesting interview that Derek did with AZ Central in lieu of their show in Phoenix, AZ, on July 20. Q: How difficult is the show? A: It’s extremely challenging. We’re in every single number. It’s pretty relentless. Q: So how do you relax after that? A: That’s the thing. I went straight from “Dancing With the Stars” to this show and then will go into my book tour (his first book, “Taking the Lead,” will be published in August). It’s momentum. It’s always good, to keep moving and keep going. 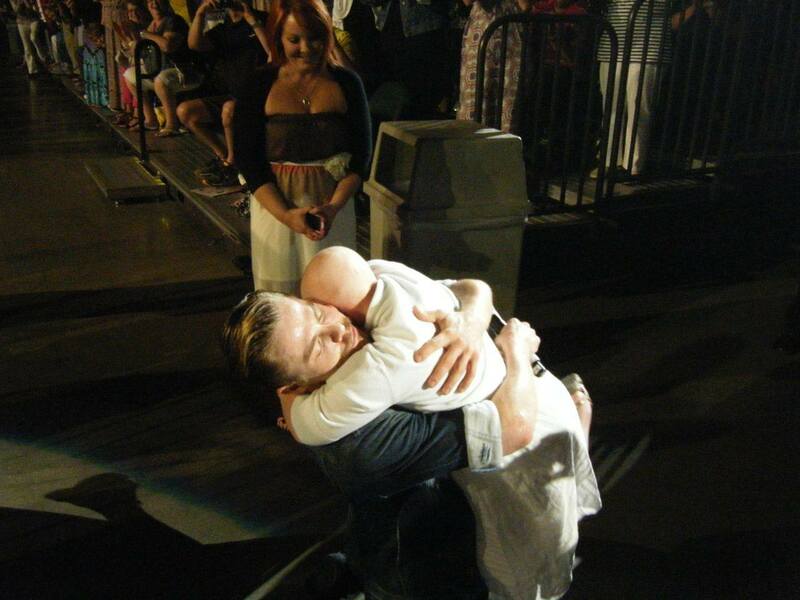 Q: What’s more pressure: Being judged on “Dancing With the Stars” or doing this? A: I wouldn’t say there’s more pressure. There’s just more of a standard, if you know what I mean. I always hold a certain standard for myself, whether you’re playing for 6,000 people or 700 people. I always want to make sure I go up there and give the best performance I possibly can, and I want to get better and better. Derek also started to promote his new book coming out on August 5th called “Taking the Lead: A Live Lived in Motion”. I cannot wait to read this book and learn what makes this guy tick! Haha! Make sure you pre-order the book here! Love the fan response from the Chicago show! Check all the great tweets, photos, and videos taken from last night. 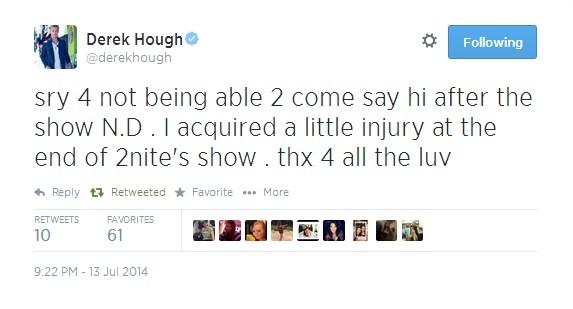 I also read that Derek, Julianne, Nina and other friends went to a nearby club after the show! HQ Photos from the Chicago Theater Facebook! #happy at the #moveliveontour — so fun!